Every year, for a short season when the nights are below freezing and the days are warm and sunny, a few families in Galway, who are fortunate to have maple trees on their property, tap their trees. What do you like to put real maple syrup on or in? My family is tapping for the first time this year and we have already changed the equation a bit on this one. We use the plastic bags. The big blue bags cost less, so for our first year, my family decided to use them. They are strong and reusable, but sometimes they slip from the clips that my dad made and sap spills all over the snow. We have not yet had any problems with animals chewing through the bags, but it is possible. One look at my backyard will make you laugh. 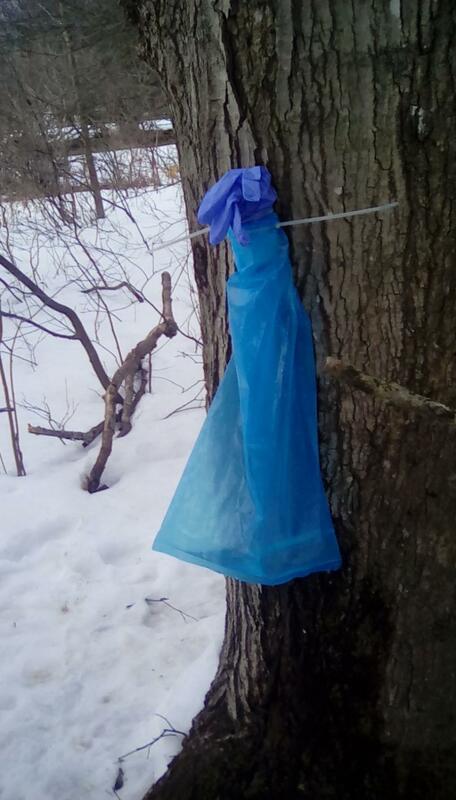 From the bright blue bags hanging from the trees to the homemade clips that my dad made out of pipes, zip ties, and a silly looking blue plastic glove on top to try to prevent bugs and twigs from falling into the sap, it’s quite a sight. A quick glance around Galway will tell you most people still like to use the classic silver pails. The families of junior Jacob O’Brien and sophomore Nick Keller win the category of Most Trees Tapped. They both have 40 trees tapped this season. Jacob said they have tapped up to 45 trees in the past. This is his 6th year tapping trees. Nick’s family had 10 trees tapped for their first 2 years but decided to amp up their operation this year. Senior Ella Decker’s family has 27 trees. Last year, her family tapped 9. Senior Justin Matthews tapped 4 trees last year and this year he has tapped 10. This year my family has only tapped 4 trees. We do have more maples in our yard if we decide we want to tap more next year. O’Brien’s family also tapped a telephone pole. It doesn’t produce any sap–just smiles. Hauling buckets of sap from the trees can be a pretty good workout but some have found a way to make it a bit more easy on the muscles and save some time. O’Brien uses a 4-wheeler. Matthews said his sugar bush is 3/4 a mile away from his house so he has been using a snowmobile often this season. My family does not have a very long walk from the trees to our house or fire pit, so we just carry them. The bags are not very heavy. 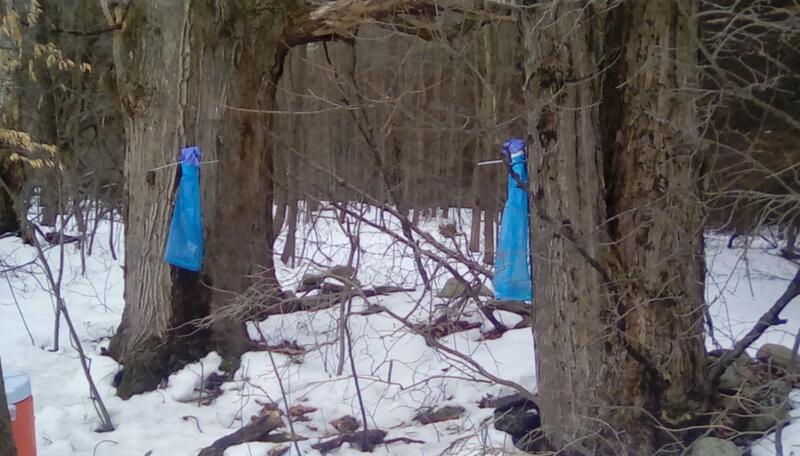 Collecting sap can be frustrating at times. The O’Brien family has had some unpleasant experiences when they have accidentally dropped the sap bucket and it has spilled all over them. They also have had times when the sun spoiled a whole barrel of sap. This is a huge annoyance. The filtering process is what annoys Matthews. No matter how many times you filter the sap, there is always something floating in the bottom of the pan. Most of the time it is only sugar, but it looks like it could be anything. Besides increasing the amount of pails from year to year, it seems there are changes to the cooking process. 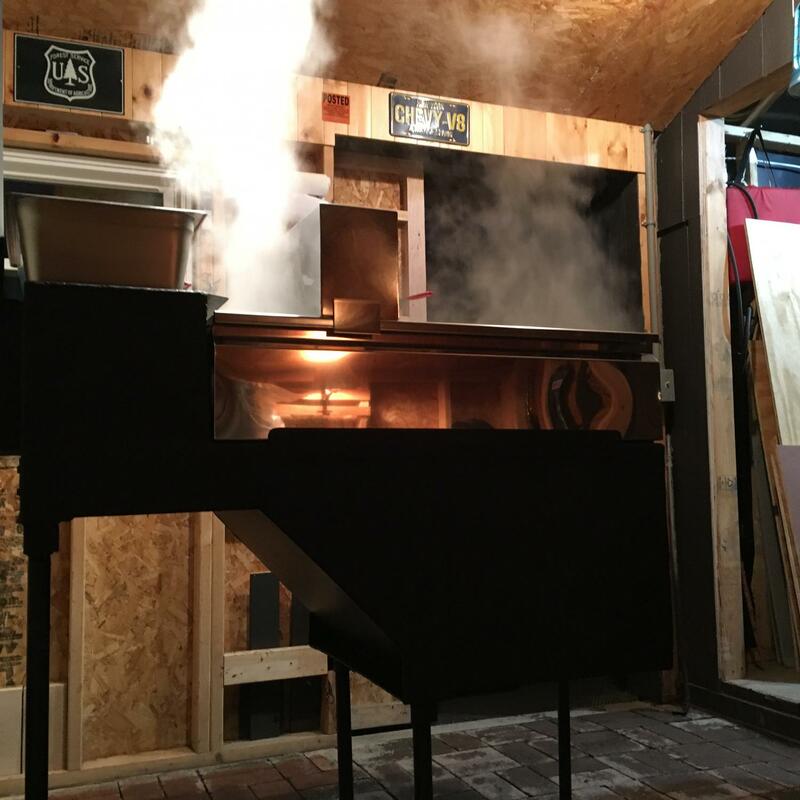 Nick Keller’s family cooked on a open fire the first two years but purchased an evaporator from a place in Maine this season. The O’Brien family used an old stove that Mr. O’Brien traded some syrup for, and it worked good for small batches. Their evaporator now is actually that same stove with some modifications to it. Both families also built sugar shacks. The O’Brien family built their sugarshack in 2012. At that point, it was mostly just the frame and a roof. We still had a dirt floor. In 2013 they put the walls up and added a door, as well as a brick floor. From then only a few small changes have happened, mainly running electricity out there and hanging signs. Justin Matthews is outside using a wood stove that belong to his late grandfather. The Decker family has a set-up similar to what Matthews used last year–they modified a steel drum. My family uses a fire outside or uses our kitchen stove. Both of the techniques have problems. While cooking outside, my dad attempted to use a large board to keep the wind from blowing out the fire. He walked away for a few moments, to have lunch inside, he left the board leaning against a chair so it would remain standing. A few minutes later, all you could see out our window was steam. The wind blew over the board, which fell towards the fire and knocked a pan of boiling sap off of the fire. The sap spilled into the fire and we lost 1 3/4 pans of sap when sap splashed out of the remaining pan. While cooking indoors, so much water evaporated that the walls of my house had water running down the walls. Boiling sap is a hard, long process. Some families make it more enjoyable by having friends over. This is Jacob O’Brien’s favorite part of the sap boiling process. My family has also had some fun with the cooking. 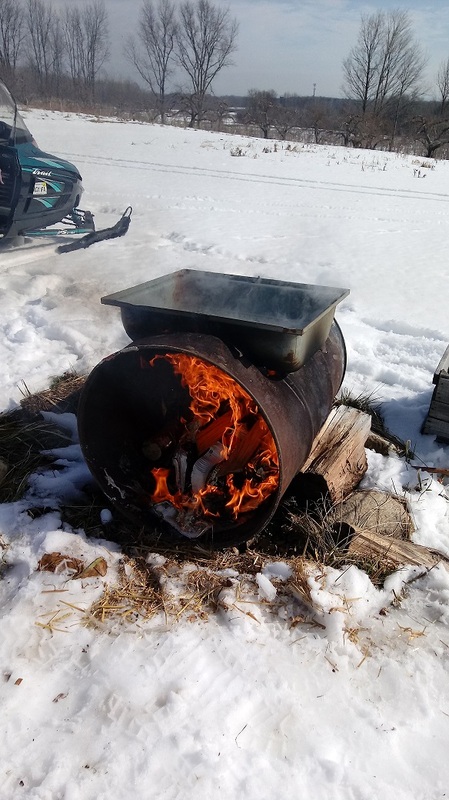 On our first day boiling sap, we had a picnic breakfast by the fire before my grandparents came to visit. My grandfather really enjoyed watching the process of boiling sap. By the time the boiling is done, there is not nearly as much liquid in the pan as there was at the start of the process. A lot of sap only makes a little syrup. 40 gallons of sap only makes about 1 gallon of syrup. 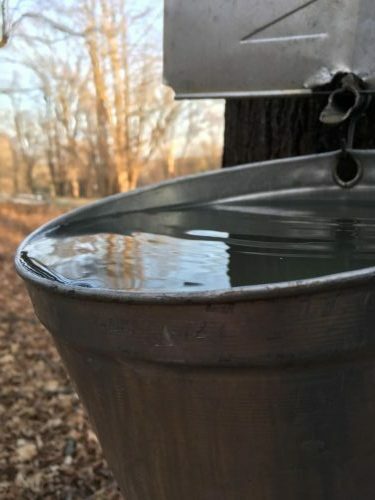 The O’Brien family has collected about 400 gallons of sap and made about 7 gallons of syrup, although they hope to make at least 3 more gallons. The amount of syrup that is made depends on how much sugar is in the sap. The Matthews family has made about 3 gallons. My family has made about 4 cups of syrup. 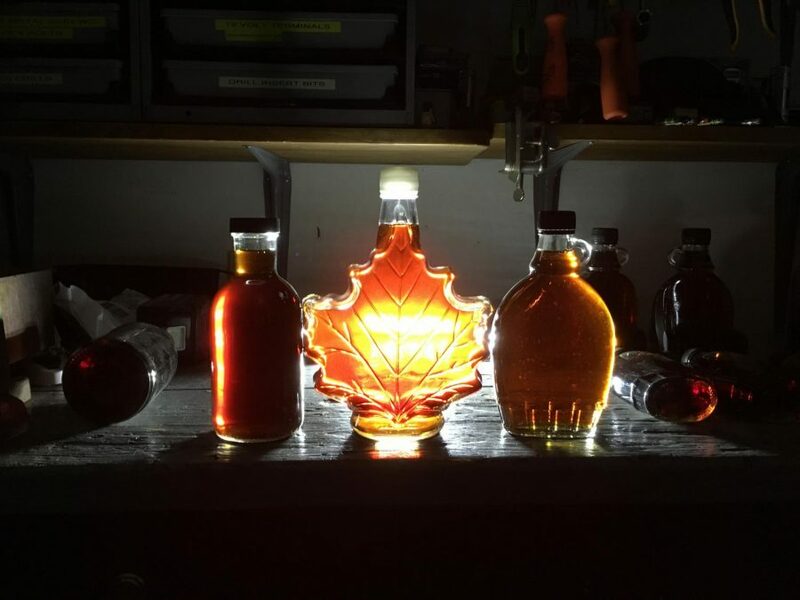 Some families make syrup for the fun of it, while others do it for the love of maple syrup. For Jacob O’Brien, the beginning of the season is more about the fun of the process, but at the end of the season, it becomes more of a chore. Justin Matthews agrees that his family does it for a little bit for the process and a little bit for the product. He finds the process fun and rewarding. Each family seems to like gifting it to family and friends. It also seems to be about the tradition and the shared experience. Matthews said he helped out his soccer coach, Mr.Evans, last year when he wasn’t boiling his own. I love the article. Very Well thought out. Love all the details you put in. Definitly would say you worked hard on it.